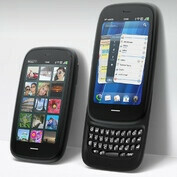 The HP Pre 3 is under the spotlight again, and it seems like the upcoming webOS flagship is nearing its release. Fortunately, we are not dealing with rumors and blurry Pre 3 photos anymore – the HP Pre 3 is already available for pre-order through Amazon.de. The only thing that is a bit worrying is that the Pre 3 is listed as out of stock and that an estimated shipping date is not available. At least the listing is giving us hope that the anticipated webOS smartphone could not be that far away from launching. As far as its price goes, the HP Pre 3 can be pre-ordered for 450 Euro or around $640, which sounds like a fair price for a contract-free device of its class. Shaped similarly to its little brother, the HP Veer, the HP Pre 3 offers a 3.6-inch touchscreen with a resolution of 480 by 800 pixels. On the inside, the device is powered by a 1.4 GHz single-core processor backed up by 512 MB of RAM, and the neat-looking webOS 2.2 mobile platform is in charge of the whole show. phone arena!!!! save us from these ads!!!! !